HP aims to provide the perfect combination of portability and performance with the Pavilion dv2-1030ea. While this isn't a massively powerful machine, HP has produced a compact laptop that's capable of carrying out basic multimedia tasks. The 12.1-inch, 1280 x 800-pixel screen is bright and provides vibrant colours thanks to the use of LED technology. Pictures and movies look great as a result, although the Super-TFT screen is very reﬂective and proves distracting when used in bright conditions. The chassis is built from hard glossy plastics and proved to be surprisingly durable. The HP Imprint-patterned design scheme has been used and will repel and attract people in equal measure. The smart metallic trim looks great, however. The keyboard is suitably solid, but provides a slightly more cramped typing experience than other machines. The board is smaller than its rivals here and the keys travel further, requiring you to arch your hand to push down. HP has collaborated with the processor manufacturer AMD to produce the Athlon Neo, a processor small enough to ﬁt in a tiny chassis, but capable enough to power large applications. 2048MB of memory has been included to aid performance but, ultimately, it isn't as good as we'd hoped, and fails to match the strong competition. While basic ofﬁce tasks and internet browsing proved largely smooth, even during multi-tasking, the machine showed signs of lag as soon as we tried resource-intensive applications, such as movie editing software. 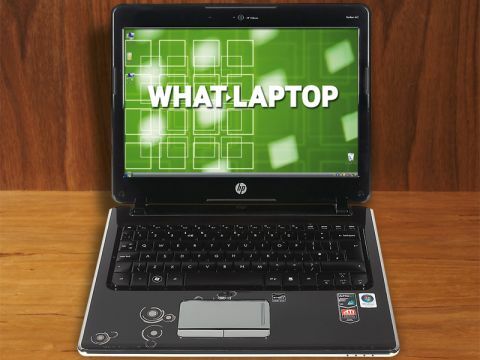 This is despite the use of a dedicated ATi Radeon HD 3410 GPU with 512MB of dedicated video memory. The dv2 doesn't feature an integrated optical drive, but an external drive is included with every machine and provides read/write access to CDs and DVDs. The drive also boasts LightScribe technology, enabling you to burn an image and text on to the surface of compatible discs. Fixed storage and portability are also good. The 320GB hard drive provides plenty of room for your ﬁles and folders and the chassis is rugged enough for life on the road. Unfortunately, the 128-minute battery life is very poor, so you'll have to carry the charger around with you. Wireless connectivity is provided by 802.11g Wi-Fi, and the inclusion of three USB ports is generous on a chassis of this size. The HDMI out port is useful for connecting the laptop to external sources. While the Pavilion dv2-1030ea is a decent laptop with some nice features, in terms of power and speciﬁcations, it's expensive and worth looking elsewhere.